I picked up an AppleTV this evening after a lot of thinking about how this device can be used instructionally. 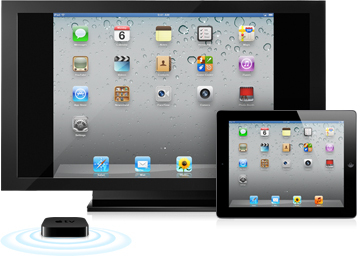 You see apple has quietly added features to the whole mirroring concept in iOS 5 so that now you can mirror the entire iPad through AirPlay so that the iPad can be displayed on an HDTV or projector! I’ve been thinking about what this can mean for a classroom. With one iPad and an AppleTV connected to a projector, a teacher could have an interactive tablet presented to the class. Imagine passing around the iPad and allow student work displaying on the screen. The portability of this system allows the teacher to present content but have the freedom to monitor the entire class. They can even put a student in charge of controlling the presentation and the teacher can truly focus on discussion. The teacher can manage a presentation using the Prezi app and walk around the room at the same time. The device is insanely tiny and lightweight. No movable parts and a low heat output. It is so simple in design! Steaming HDTV is full quality and just amazing. No lag or buffering and no glitches in the video stream. The AppleTV has an A4 chip in it which is the same chip that is in the original iPad. This chip makes it possible to simultaneously process digital content and wireless signals. When you consider that it also comes with an apple remote it is an impressive price point at $100. Factor in the $40 HDMI iPad adapter that you didn’t have to buy and you are coming out quite well indeed! With this processing ability, is it possible that Apple will start bringing in apps? Rumors have already begun with the announcement that apple is planning on releasing its own TV set by 2012. The idea of including Siri in a television is an amazing idea. Of corse, apple has probably planned out an brilliant implementation plan and will ensure an easy transition and “it just works” approach to all future generations of Apple TV. I can see potential for apps in an apple tv for education. The ability to open up dragon dictation as a teacher goes around the room asking students for ideas In a brainstorm session. Then go into Popplet app and concept map the ideas. Students could take turns entering data in a spreadsheet as anyone in the class to refer to the data on the screen. Now on the down side of things, the Apple TV I purchased tonight had software version 4.3 and the AirPlay Mirroring feature requires 4.4 which means that currently stock at most stores is probably still in 4.3. Normally, you should be able to update using the update feature in the settings of Apple TV, however to update to 4.4 requires you install through iTunes plugged into a computer. Fortunately I have some micro USB cables lying around and am able to plug it into my Mac… otherwise I would be extremely frustrated right now. This is an unfortunate aspect of Apple TV; not enough demand to ensure top notch implementation. Still, at this price and the features possible, I think it is a win! This entry was posted in 21st Century Skills, AppleTV, edtech, iPad, IWB, Productivity. Bookmark the permalink.